We live in a world where radiated pollution, instability and interference undermine both the AC line quality and the signals within our equipment, seriously affecting the performance of electronic systems. Quantum Resonant Technology provides a unique and uncompromised approach to the treatment of AC mains power and magnetic field effects in critical signal applications. Quantumâ€™s proprietary, modular circuit delivers proven, measurable results without the negative effects that limit the performance of more conventional approaches. When we listen to music through a hi-fi system or watch a movie on a home theater, what we are actually hearing and seeing is the power supplies that drive that system, and on an even more fundamental level, the power that is fed to those supplies. Itâ€™s a lesson the hi-fi industry has been slow to learn and even slower to deal with. Basic hardware like AC mains cords have only recently made it onto the hi-fi set-up agenda. Yet, the quality of the electricity reaching your system is critical to its performance, with EMF noise and waveform distortion all undermining the performance of those expensive hi-fi components youâ€™ve invested in. Whilst conventional filters can limit the destructive impact of these problems, they impose their own associated performance costs, raising the source impedance and reducing the peak current capabilities of the AC line. These limitations cause their own readily audible or visible side effects, limiting musical dynamics and robbing images of depth and color. QRTâ€™s proprietary circuitry acts at the source of the problem, reducing EMF noise and RFI interference effects on the mains waveform, audio and video signals â€“ and it does it without limiting the voltage swing or altering the impedance of the AC supply. Which makes the job of your hi-fiâ€™s power supplies and active components much, much easier â€“ and thatâ€™s what you hear from your system or see on your screen. Use a QRT purifier and youâ€™ll experience a lower noise floor, greater clarity and separation and increased dynamic range, qualities that are just as apparent (and measurable) when it comes to the color, definition and detail on your AV display as they are in the context of a really great stereo set up. The result? Greater overall musical and visual coherence, more stable perspectives, greater realism. 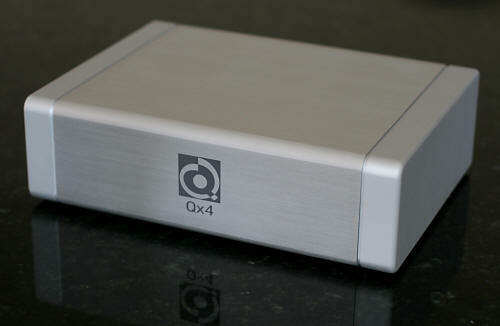 The Quantum Qx4 is a specially designed, mechanically inert casework,containing four QRT field generator modules. It does not limit peak voltage swing or alter the power supply impedance and is capable of passing sufficient current to supply an entire system. The Qx4 can be used individually, between the wall socket and your power strip, or within the system itself to feed an individual component. It is particularly effective used in this role in conjunction with a QB8 feeding the system as a whole.